Alongside its new Lumix S1 and Lumix S1R full frame mirrorless cameras, Panasonic has announced three lenses to kick off its Lumix S lens range. 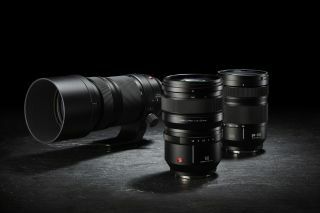 They are a 24-105mm f/4 standard zoom lens, a 50mm f/1.4 fast prime and a 70-200mm f/4 constant aperture telephoto zoom. The lenses are based around the Leica L-Mount as part of an ‘L-Mount Alliance’ announced last year between Panasonic, Leica and Sigma. It’s especially important that Panasonic gets lenses out for its new system as soon as possible because unlike Canon and Nikon, its other new full frame mirrorless competitors, Panasonic doesn’t have a full frame DSLR lens range to fall back on. Sony already has a large range of native E-mount lenses for its own full frame cameras. For Panasonic, the focus (sorry) is on professional users, so two of the new lenses will be Lumix S Pro models, designed to the most exacting optical standards under the scrutiny of Leica. However, a 70-200mm f/4 and a 50mm f/1.4 would probably not be the first lenses a pro would ask for with a new camera system. All three new lenses are dust and splash resistant and designed to operate at temperatures as low as -10 degrees, to match the weatherproofing standards of the Lumix S1 and S1R cameras. A nice touch is that all three lenses share a 77mm front filter attachment ring. They use a sophisticated autofocus motor system operating at the same high data communication frequency (480fps) as the cameras and their new Venus processors. The new lenses are aimed at both stills and video, and designed to suppress ‘focus breathing’, where the focal length and hence magnification shifts as the lens focuses – this is a common problem with regular lenses in video recording. This is the most likely ‘standard zoom’ for the Lumix S1 and S1R. It’s not part of the Lumix S Pro range, but it nevertheless offers a constant f/4 maximum aperture and an extended 24-105mm focal range which is becoming popular as a ‘long standard zoom’ for full frame cameras. This lens has a built in image stabiliser which works with the cameras’ in-body stabilisation system to offer up to 6 stops of shake compensation. It has 16 elements in 13 groups, with two aspherical lenses and two extra-low dispersion lenses to suppress chromatic aberration and provide edge-to-edge sharpness across the frame. The zooms weighs 680g. It also has a special party trick – a 0.5x macro mode. Many zoom lenses offer a so-called ‘macro’ mode that’s not really close to a true 1:1 macro magnification at all, so this lens focuses very close indeed for a standard zoom. The S 24-105mm will go on sale in March for £1,299 / $1,299. A fast 50mm prime is another box ticked in Panasonic’s fledgeling Lumix S lens range. This one is part of the Lumix S Pro series, and boasts an 11-bladed iris (aperture) for “exceptional” bokeh, and consists of 13 elements in 11 groups, with two aspherical lenses and three extra-low dispersion lenses. Panasonic claims “outstanding” sharpness across the frame. Weighing 955g, this lens does not come with its own in-built optical stabiliser, but the Lumix S1 and S1R have 5-axis in-body stabilisation claimed to offer up to 5.5 stops of shake compensation, so the lack of a stabiliser in the lens is not necessarily a significant drawback. This is in contrast to Canon’s EOS R system, where lens based stabilisation is all there is. The minimum focus distance is 0.44m and there is a 77mm front filter ring. The 50mm f/1.4 will be available in March for £2,299 / $2,299. The third lens to be announced is the Panasonic Lumix S PRO 70-200mm F4 O.I.S. a constant-aperture telephoto zoom, again with the upmarket Lumix S Pro designation. \It’s a little surprising that this is an f/4 lens rather than a 70-200mm f/2.8, however, and although Panasonic claims it’s designed for beautiful bokeh with 9 aperture blades, it seems extremely unlikely it’s going to give the same super-shallow depth of field of the 70-200mm f/2.8 lenses from other makers. Designed for sports, action, wildlife and even portrait photography, the Lumix S Pro 70-200mm has an in-built optical stabiliser working with the in-body stabilisation system to offer up to 6 stops of shake compensation. It uses 23 elements in 17 groups, including a single aspherical lens and three extra-low dispersion lenses. Panasonic says it’s designed for minimal vignetting and chromatic aberration, and high sharpness and contrast across the frame. The 70-200mm f/4 will go on sale in March for £1,749 / $,1699. These three lenses are a solid start for Panasonic’s Lumix S lens system, and the company is promising to have at least 10 lenses for the system by 2020. Further lenses are already available from Leica, and Sigma is set to launch more than a dozen lenses for the mount this year.